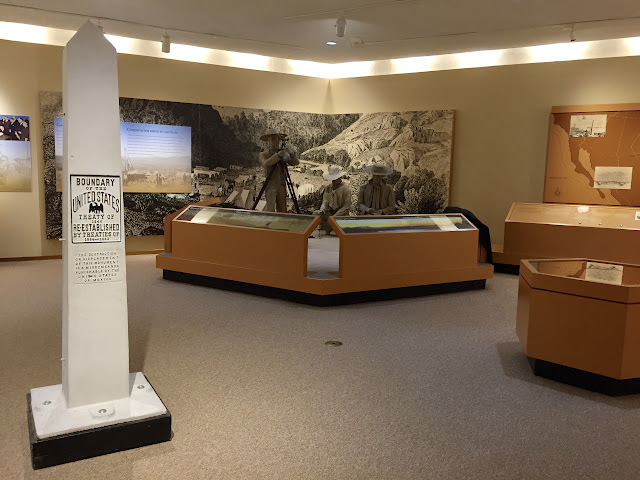 Back in the saddle on Sunday after our brief hiatus, we set out to see a couple of El Paso sites before leaving town. First stop was at the Chamizal National Monument along the U.S.-Mexico border. The site commemorates the 1964 agreement that settled a century-long border dispute between the two countries. 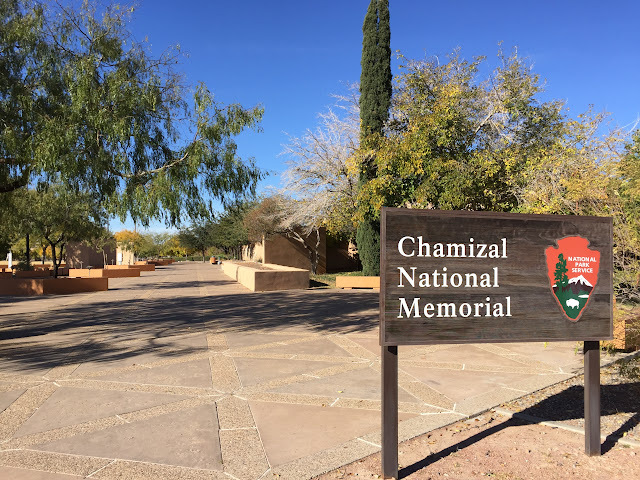 CHAMIZAL REFERS TO THE AREA WHICH WAS UNDER DISPUTE, NAMED FOR A NATIVE PLANT. 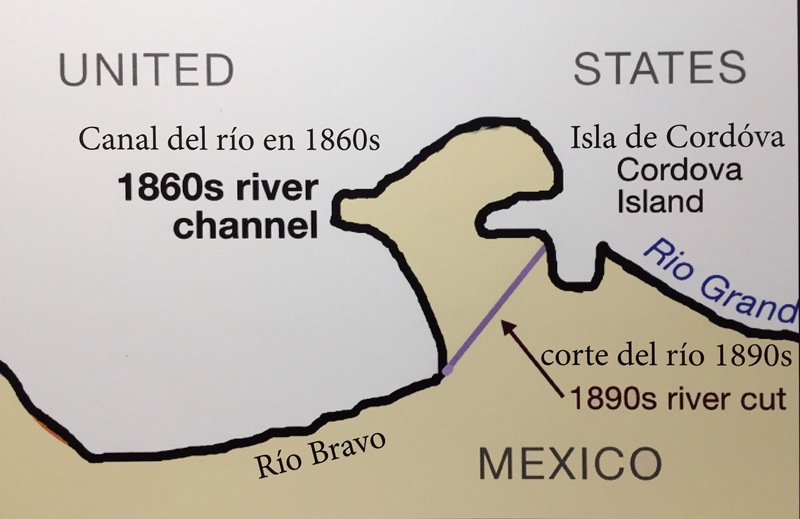 When the boundary was established in 1848, the deepest channel of the Rio Grande River was selected as the line due to what was thought to be its reliability in remaining on the same course. Then came two catastrophic floods which trenched a new bed for the river and left 700 acres of Mexican territory on the Texas side of the Rio Grande. 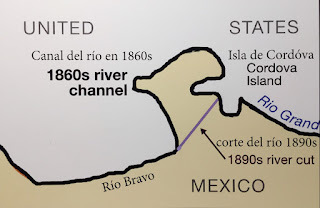 After almost 100 years of disagreement over the proper border and the piece of land isolated by the frequently changing river, diplomats negotiated a treaty which would constrain the wandering river in a 4.5-mile concrete channel between El Paso and the Mexican city of Ciudad Juarez. Thus ended the river's nomadic tendencies, and the permanent border between the two countries was achieved. THE NAME CAME FROM NEIGHBORS' COMMENTS ABOUT THE DECORATIONS. 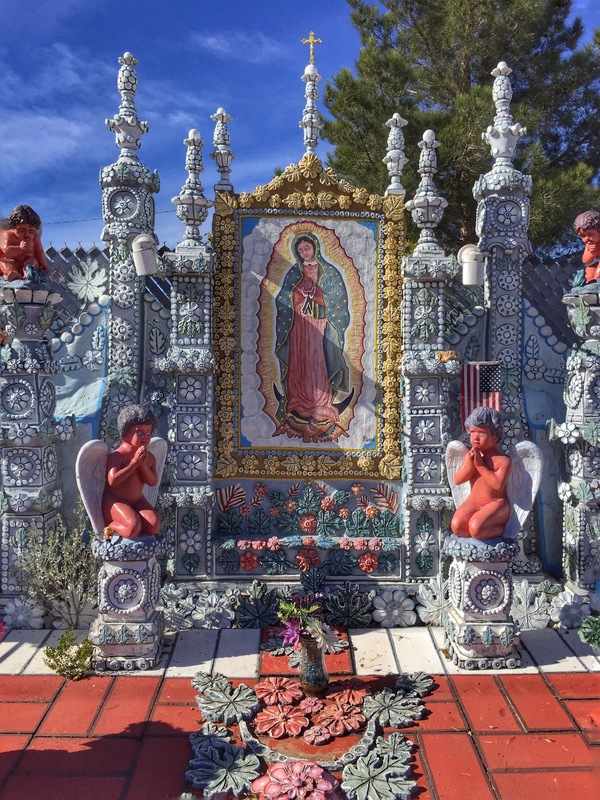 El Paso had a generous collection of roadside attractions, according to Roadside America, the self-proclaimed guide to uniquely odd tourist attractions and our primary source of information about such matters. The one we couldn't resist was the Sugar House. A 38-year-long labor of love by now retired Levi Strauss worker and self-taught artist Rufino Loya, this masterpiece of folk art is an homage to his wife, for whom he promised he would create something beautiful, and to his adopted city of El Paso. 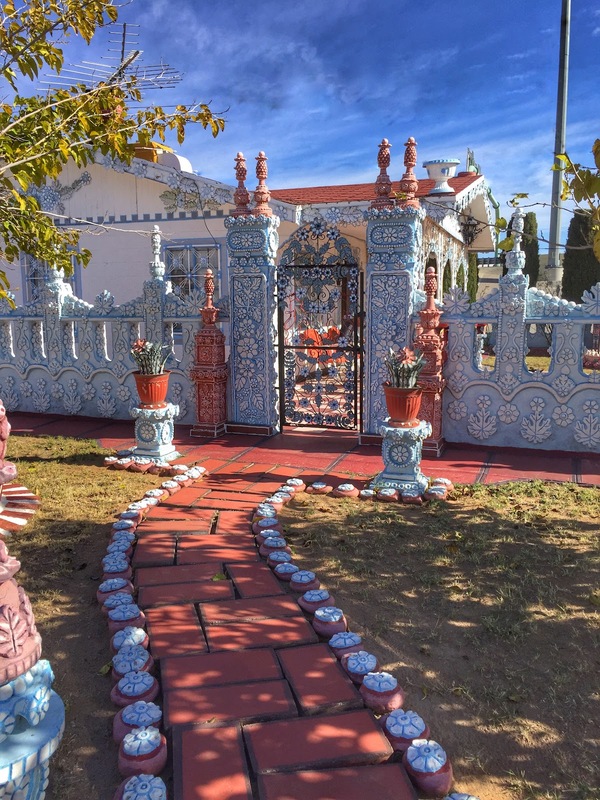 Tucked into a modest neighborhood near a freeway, La Casa de Azucar took its name from the flowery decorations which Loya handcrafted from concrete. When his neighbors commented that the lacy ornamentation looked like frosting trimming a cake, Loya gave in to its inevitable name—the Sugar House. We were lucky enough when we visited Sunday morning to find Mr. Loya sitting on his front porch. As we admired his artistry, he graciously came over and talked to us about his project. 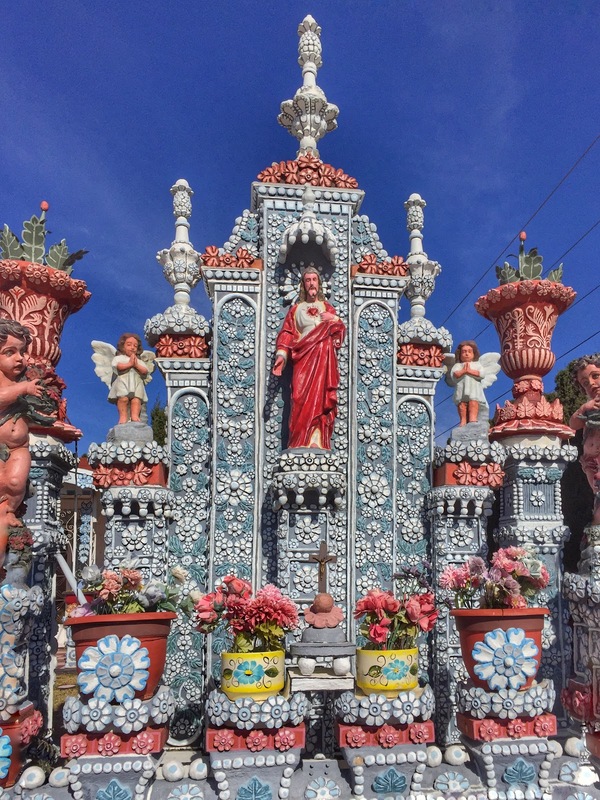 He was inspired by the Catholic churches he saw growing up in Mexico, he said. And he reiterated what one of the signs proclaims, "This house is a little piece of Mexico." 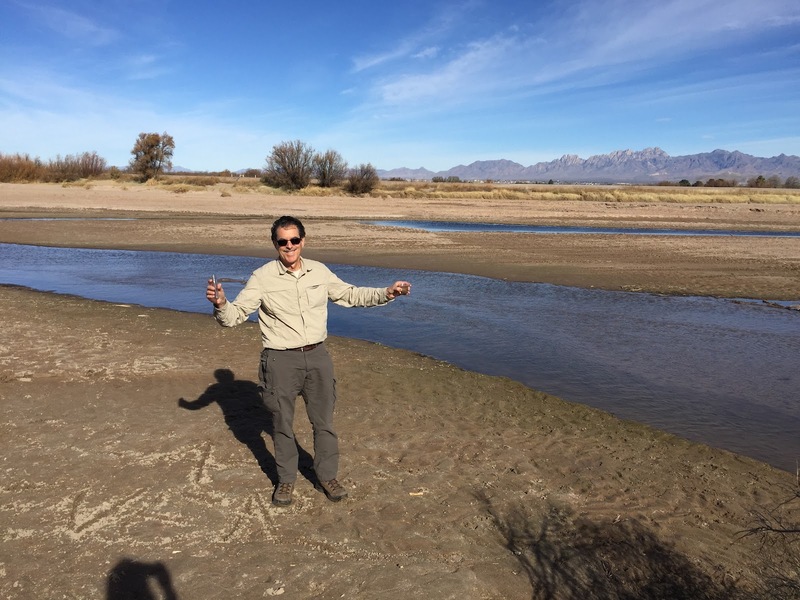 THE RIO GRANDE WAS NOT SO GRANDE AT THE POINT WHERE WE COULD APPROACH IT. 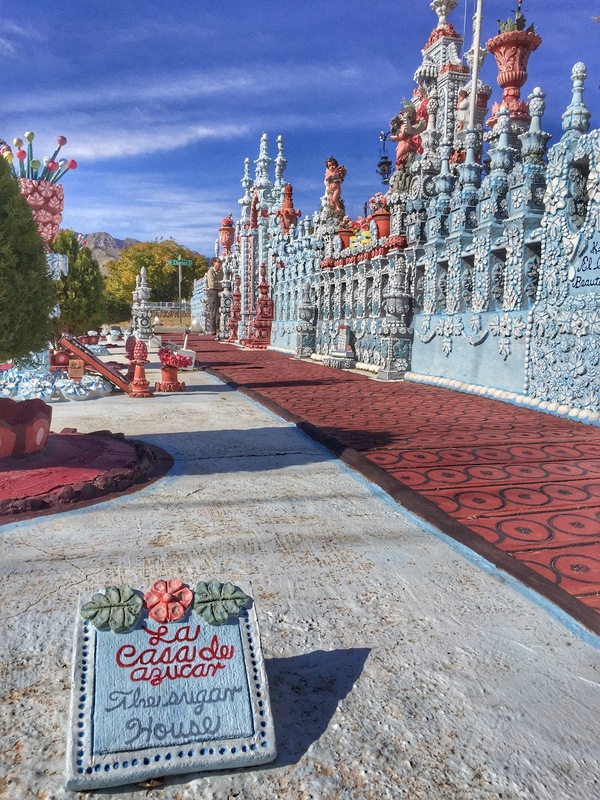 With our sweet tooth for quirky attractions satisfied, we moved on west into New Mexico, following the path of letterboxes we wanted to find. After a brief stop in the small unincorporated hamlet of La Mesa, we paused near a park to dip up un poco agua from the Rio Grande River for our collection of waters. 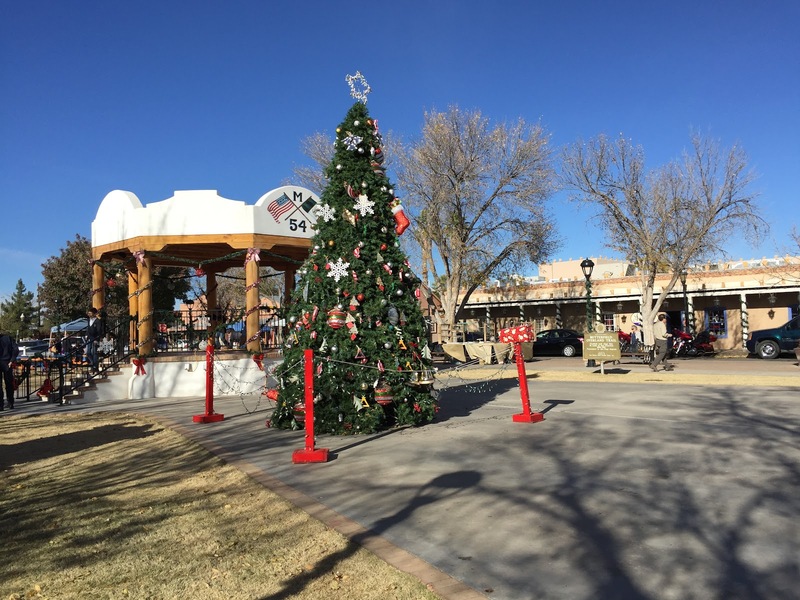 MESILLA'S TOWN PLAZA WAS BUSY WITH HOLIDAY ACTIVITIES. Then we moved on to the historic village of Mesilla (pop. 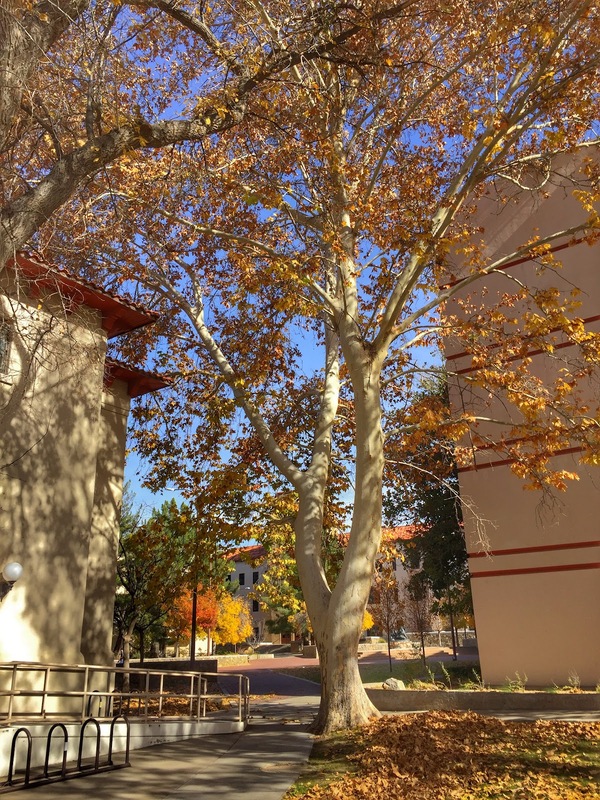 2,196). 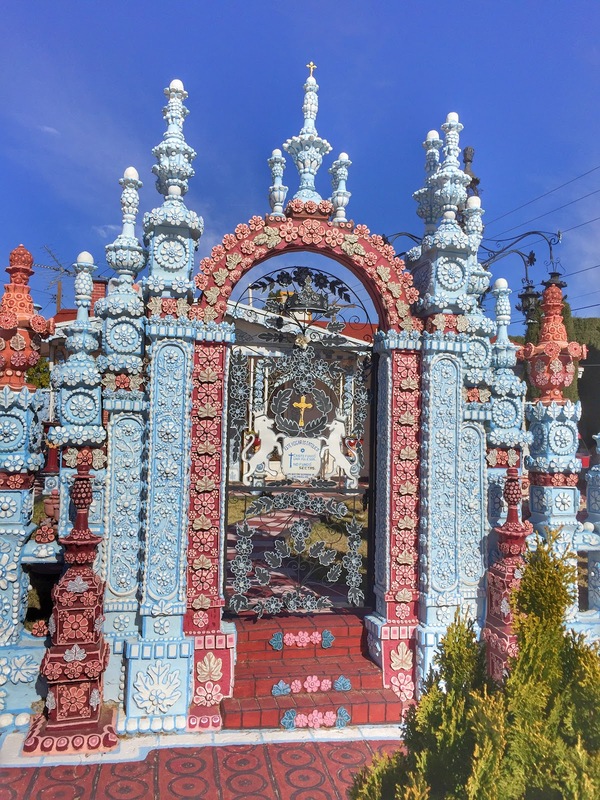 Founded in 1848, the town is now considered a National Historic Landmark. Today it is popular with tourists and home to numerous local restaurants and shops…and, as it turns out, letterboxes. It is also just a mile or so from Las Cruces (pop. 97,618), the largest town in the area and our stopover point for Sunday night. 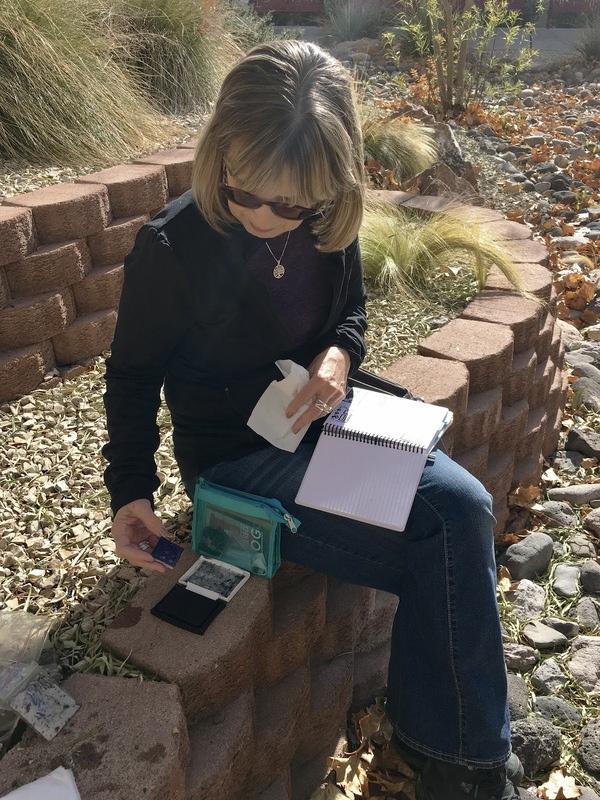 Before leaving the city Monday morning, we searched for a few letterboxes in Las Cruces, including one on the campus of New Mexico State University. The clues were a bit abstruse in reference to a sculpture on campus, but between the two of us, we eventually sorted out the meaning and were stamping in. Further down the road, we paused to check out the aptly named Rockhound State Park near Deming. 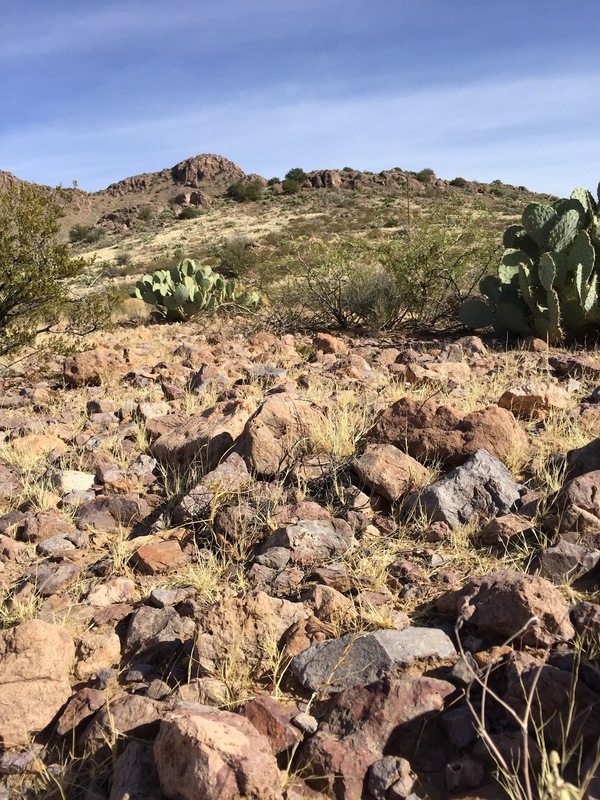 Unlike so many parks which prohibit your removal of any natural or historic objects, here rangers encourage visitors to collect rocks (up to 15 lbs.). The ranger we spoke with actually advised us to go off the trail to seek interesting specimens. Our initial plan had been to make it to Tucson for Monday night. But as we moseyed across New Mexico, it became apparent that we wouldn't make it—not without sacrificing some sites we'd like to check out along the way. 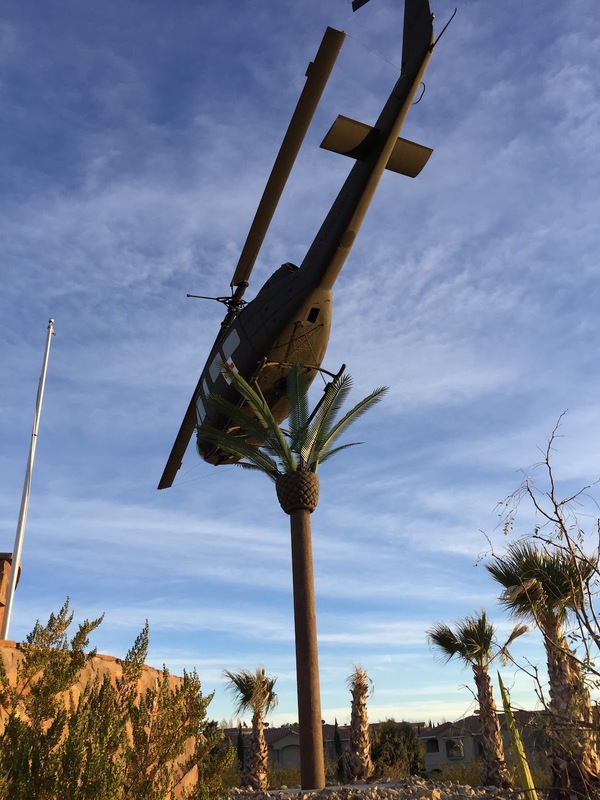 So we stopped for the evening in the wee town of Lordsburg (pop.2,665), which happened to have a Hampton Inn because of the town's proximity to I-10. Tomorrow we'll drive into Arizona and maybe even make it to Tucson—or maybe not. Loved: We were thrilled that folk artist Rufino Loya happened to be sitting on his front porch at the time we came by the Sugar House. The opportunity to talk with him and hear about his project enriched our visit. 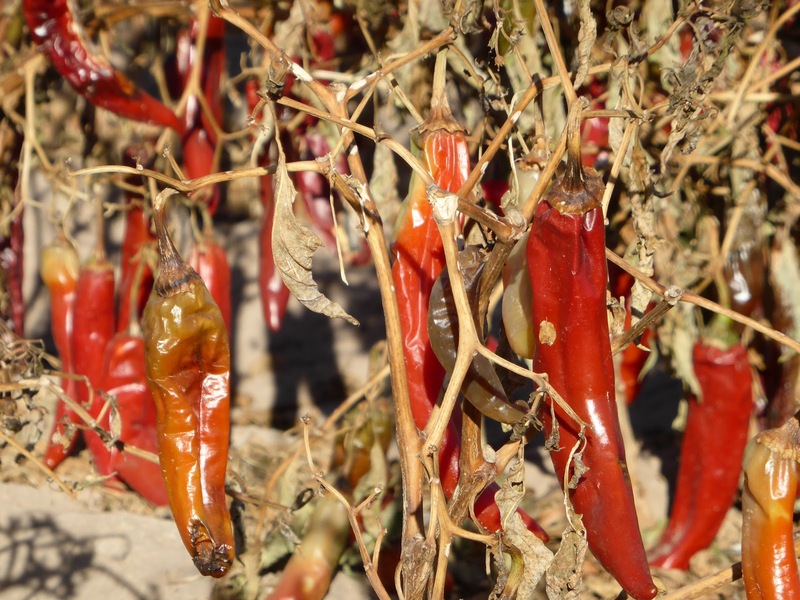 Lacking: Places in Lordsburg to obtain a healthy meal for dinner. Between the tiny grocery store and the "We Fry It—You Eat It" local restaurants, the choices were dismal. 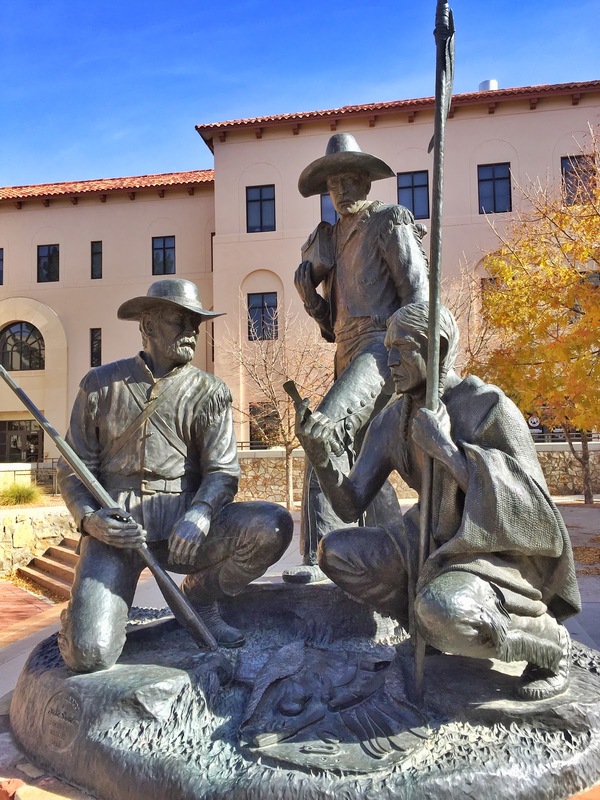 Learned: We had no idea the Rio Grande River had to be manhandled to persuade it to stay in place and act as a stable border. EXHIBITS AT THE NATIONAL MONUMENT TELL THE STORY OF THE REPEATED SURVEYS. 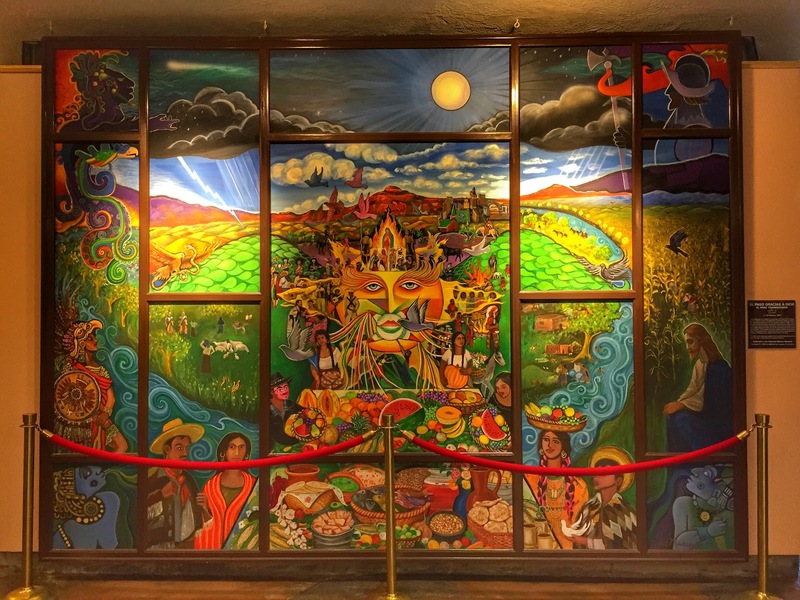 AT CHAMIZAL, THIS LARGE PAINTING DEPICTS EL PASO'S FIRST THANKSGIVING IN 1598. THE AREA AROUND MESILLA IS CHILI PEPPER COUNTRY. 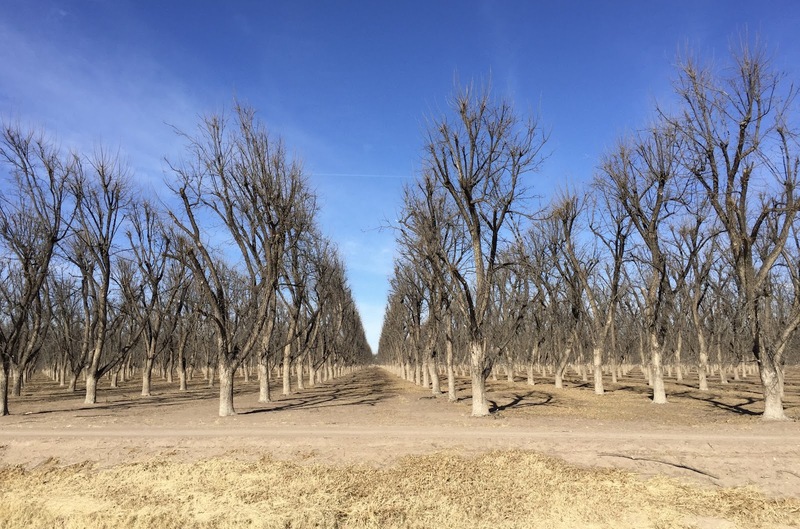 PECANS ARE ALSO A MAJOR CROP IN THE AREA. WHY THE FAKE PALM TREE IN THIS LAS CRUCES VETERANS PARK? NATIVE AMERICAN IN THIS 1988 SCULPTURE HOLDING A CELL PHONE?